Top Rated Local® is pleased to announce that Hackworth is one of the top 10 sign companies in the entire state of Virginia! “Our company had to participate in a trade show at Chesapeake Conference Center, and I was assigned the task of banner printing in VA. I was looking for some impressive banner printing services in Norfolk that could really make my company’s presence felt at the show. I came across Hackworth, and they seemed to have the experience and the technology to match the occasion. I am more than happy to have hired them as they delivered some excellent banner printing, which was duly applauded by everyone. The banners served their purpose well and kept drawing prospective customers, one after the other. Good printing services. We had an excellent response at the show, will surely use them again.” -Peggy B. “Great customer service and competitive pricing. We’ve used Hackworth to procure and maintain all of our large-format GIS production printing and scanning equipment for the past six or seven years and have never been disappointed” -Trent P.
“Have used Hackworth for many printing needs over the years. [I] always receive my items quickly and [they are] done correctly.” -Lisa F.
We spoke with Mark Rowan, the marketing director at Hackworth, about the business’ impressive online reputation and overall success. Thank you for speaking with us, Mark! 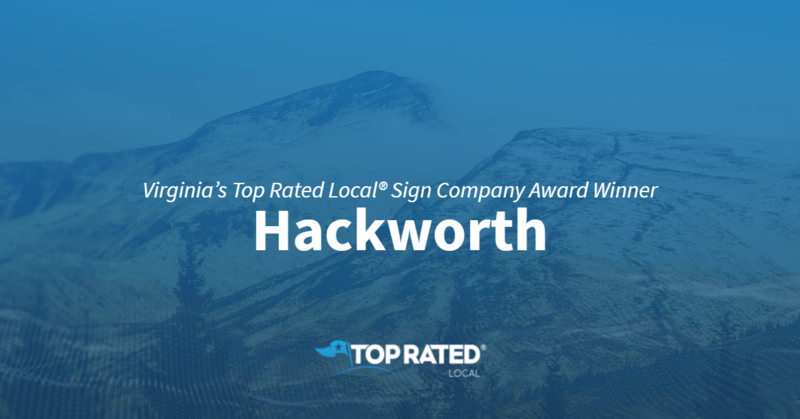 Congratulations to the team at Hackworth for being a 2019 Top Rated Local award winner!